This is it: the very last 40b40 beer I will drink as a young person. 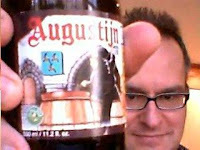 It’s Augustijn, a brew that has been made in Ghent by Augustinian monks since 1295 -- and since 1982 with a modified recipe by the Van Steenberge brewery. Does that perhaps mean it's not technically an abbey beer? This Flemish offering, I am required by Belgian law to reveal, now makes the 40b40 running count even at three/three, Wallonia/Flanders. 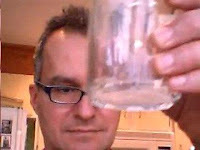 I’ve got one bottle of the regular Augustijn and one of the Augustijn Grand Cru here, but the first thing to open is the video link to deepest darkest Connecticut, where my brother should be waiting with an Augustijn of his own. Skype video works better to the US, it seems, than to New Zealand, as you can see by these photos with my bro here, which definitely don't look like those NZ moon-landing ones. After the initial pleasantries, Brian and I get down to the matter at hand. Augustijn seems to pour with an almost impossible amount of head no matter how delicately you try to dribble it down the side of the glass. Once it settles down, it’s a slightly cloudy amber. Very inviting. “Tastes like a classic Belgian ale”, says Brian, who knows his beers and even brews his own at home from time to time. He notes the “floral afterburn”, and both of us get a hint of Michael Jackson’s vanilla, though I admit it takes me a bit longer to sense it. Maybe more of a burnt vanilla? I find this beer very well balanced between sweetness, hop and alcohol, with no one flavour overpowering the others. “Mellower than Duvel”, is Brian’s final word. I have to agree there -- I find Duvel too alcoholic on the palate, pushing out other aspects of the taste. 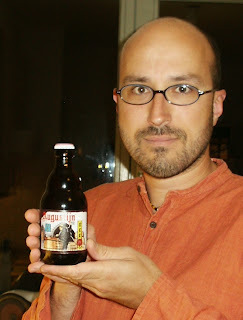 I think Augustijn, despite a slightly amateurish-looking label, is miles better for its balance and richness. Glad to see that the appreciation of beer is indeed infectious - prost!